United Arab Emirates, Dubai, 5th August, 2018: With the rise in high intensity workouts, including CrossFit, heavy weightlifting and metabolic conditioning classes, physical therapists and orthopaedic surgeons have noticed a new demographic of patients - young adults under 35 who suffer from overwhelming pain in knee, ankle, feet and shoulder. 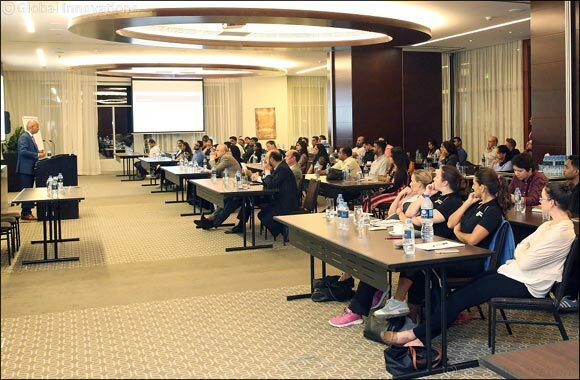 The DHA accredited Continuing Medical Education (CME) Summit, organised by Burjeel Hospital for Advanced Surgery (BHAS), Dubai brought to focus the key factors that cause such pain and also highlighted advanced treatment options to tackle these conditions. “Injuries related to the knee and foot are common with sport players. These injuries can occur due to lack of conditioning, overtraining, or improper technique or form. As such, it is important to assess the condition accurately and craft a customised treatment plan for each patient,” said Prof. Dr Erik Hohmann, Consultant Orthopedic and Trauma Surgeon and Sports Physcian, while addressing a gathering of healthcare professionals at CME. At the CME Summit, Prof. Dr Erik shed light on Anterior Cruciate Ligament (ACL) Injuries. The anterior cruciate ligament is one of the most commonly injured ligaments of the knee. In general, the incidence of ACL injury is higher in people who participate in high-risk sports, such as basketball, football, skiing and soccer. Focusing on causes, risk factors and prevention techniques, Dr Erik emphasised that the incidence of ACL injuries in women is 4 to 8 times higher than men, and while 90 percent of these surgeries are always successful, only 60 percent athletes can can return back to sports. “Injuries to Foot and ankle are common in sports and increases in the second decade. While each requires specific treatment, patients need procedures that are quick and provide enhanced rehabilitation. As such, it is important to implement a combination of traditional techniques and high-end technology,” said Dr Krishna Prasad, Consultant Orthopaedic Surgeon - Specialising in Foot & Ankle Surgery at Burjeel BHAS. Dr Krishna Prasad was another prominent speaker at CME, who brought to focus Principles of Foot and Ankle Surgery. Some of these conditions may be present at birth (congenital), others may develop later as an individual grows. Highlighting causes, symptoms, prevention and treatment options, Dr Meda stated that foot and ankle deformities affect 1 in 6 people tend to experience a injury in their life time. In the UAE, the number of people affected with foot and ankle problems is even higher given the fact that the country has a large active young population that focuses on exercising and training, making them more susceptible to sport injuries. Recently, there has been a shift, and individuals in their mid-40’s are experiencing this condition too. “Sports injury treatments have come a long way since its evolution. From cutting edge treatments to specialised surgical options, experiential developments have paved way for huge opportunities and clinical improvements that are changing the face of orthopaedics,” said Dr Bhuvan Machani, Consultant Orthopaedic Surgeon, Specialised in Upper Limb Treatment at BHAS. Dr Bhuvan Machani was another prominent speaker at CME. Focusing on Overhead injuries and Superior Labrum Anterior and Posterior (SLAP), Dr Bhuvan presented and discussed the most recent innovations, trends and concerns, practical challenges encountered, and the solutions adopted for Overhead and SLAP injuries. A SLAP tear is a torn piece of cartilage in the inner portion of the shoulder joint. It can be painful and/or limit movement in the shoulder, especially overhead. Highlighting it causes and treatment options, Dr Bhuvan stated that around 1 percent people in the world suffer from these conditions, however, the incidence of such conditions is higher in the UAE. DHA Accredited CME focused on the latest and experimental developments orthopaedics. Featuring participation from health professional from around the world CME exchanged and facilitated experiences and research result and provided attendees an opportunity to present and discuss the most recent innovations, trends, and solutions in orthopaedics raising the overall expertise and standards of healthcare professionals in the UAE and across the world.